One of the biggest questions I get asked by home owners is, is it illegal to cut down trees on your own property? I thought it might be a good Idea to answer that question for anyone else who was wondering. It is legal to remove a tree on your property if the tree is not protected by the city. Every city and county have what is called a Tree removal Ordinance which is a list of Regulations/ laws for the removal of trees. Some cities have strict laws on cutting down trees, whereas others are quite lenient. Below I will go through some universal laws which allows you to cut down a tree on your property legally, and how to get more information on your local cities tree removal ordinance laws. Do I have legal authority over trees on my property? Surprisingly the answer is no. All trees within your city are actually considered the communities trees. You do not “own” the tree just because they happen to reside on your property. The reason for this is that trees bring a huge benefit to the community as a whole such as cleaning the air we breathe, reducing the heat island affect and creating habitat for local wildlife. Cities regulate what trees can be removed, whether they should be trimmed and by how much, plus other guidelines regarding the ideal number of trees that should be planted and maintained on a property of a certain lot size. As each city has different trees, local climates and ecosystems, the regulations surrounding the trees removal laws vary greatly from state to state. You will need to refer to the tree preservation ordinance for your city or county for more information on your particular circumstances. Will I need permission to remove a tree on my property? Weather permission is needed to remove a tree on your property will depend on the size of the tree, the location of the tree on your property and its proximity to your home and other utilities such as power lines. It will also depend on the tree species and whether that particular tree species is protected or considered a nuisance. In all cities there is what is known as a Tree Preservation Ordinance. In this ordinance the city outlines a specific size of tree which is automatically considered significant and becomes protected under the ordinance laws. A heritage tree is one that has been documented to have been part of the community for 50 years or more. Any tree with a trunk circumference smaller than 12 inches may be removed without a permit. Anything larger will be considered a significant tree and therefore protected. In this case you will need permission to remove the tree. Again the above is just an example and in your particular case you will need to refer to the local laws that govern tree removal in your city. Is it illegal to cut down a dead tree without a permit? Most of the time (99% of the time) the answer is no. Dead trees especially if they have been dead for an extended period are considered hazardous. You will not need a permit to remove a dead tree. If a dead tree is left in place for an extended period, the stabilizing roots in the ground will rot away in time, and the tree will easily blow over in the next storm. You are obligated to maintain all trees on your property and that includes removal of dead trees. I do not suggest removing a dead tree on your own and you are best seeking the services of a qualified and licensed arborist in your city. What if the tree is dangerous/ unstable, Can I legally remove it? If there is a tree on your property that presents an immediate risk to personas or property, it may be remove immediately without waiting on a permit from your city. I do suggest that you seek confirmation from a certified arborist that the tree is hazardous and needs to come down immediately. To save yourself any headaches after the tree has been removed I suggest that you document the reason why the tree is dangerous with photographs and with a written report from a certified local arborist who you get in to remove the tree. So how do I know if a tree is dangerous or hazardous? In a lot of cases a tree will become unstable after a storm. After a few days of extended rain and wind the ground becomes soft and trees that don’t have a naturally stable root system will develop a noticeable lean quite quickly. If you notice a tree on your property has developed a new lean, even a slight one, it is a good idea to seek the advice of a qualified arborist. They will be able to quickly identify whether the tree needs to be removed or not. They also have to authority to act immediately on their recommendations and remove the tree without a permit. In other cases such as internal rot and weak branch unions, it is a lot more difficult to tell if a tree is hazardous. It is also always a good idea to get a tree inspection and arborist report every few years to make sure that your tree is safe. Where can I find my cities rules on tree removal? We are currently putting together a comprehensive and detailed resource for all tree ordinances countrywide but it is a huge undertaking and may not be ready while you were reading this article. 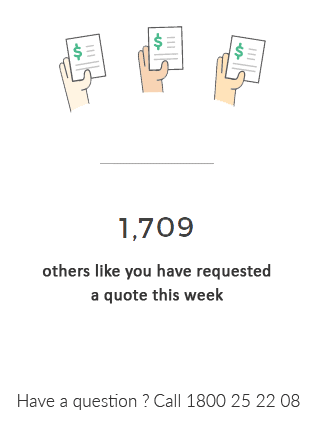 Follow this link to see if we have your city listed so you can quickly view the tree removal ordinance rules and download tree removal permit forms for your local city. 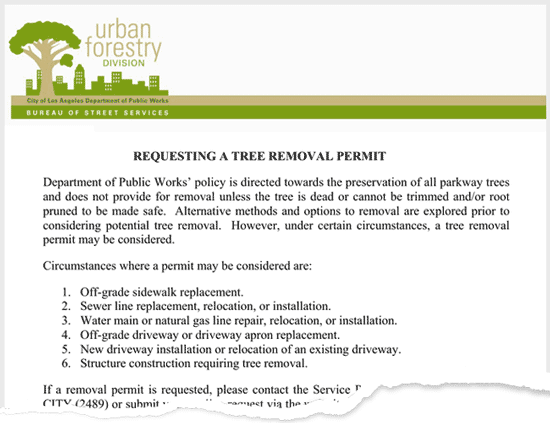 Another way would be to go to your local city or county‘s website and search for “rules on tree removal permits [your city here]”. You may have to search for words such as “Tree Removal Ordinance” and “Tree Removal Permit”. If you’re in a smaller city and you cannot find any details about the rules and regulations on cutting down a tree on your property, you may need to go to the next level up to your County website. What is the fine for illegally removing trees? This will depend on the city you live in and the significance of the tree you have removed. For example if it is illegal to remove a palm tree without permission in your city and you have done so, you might receive a fine of $500. On the other hand if you have removed a 150 year old Oak tree that stands 50 foot high and was home to a rare and endangered breeding pair of owls, you could imagine the fine would be a lot steeper. I’ve heard of some people being fined up to $5000 for removing a single tree without a permit from the city. In conclusion I think it is a good idea to know the rules and regulations for cutting down trees on your property before you do so. In most cases you find the city is very fair and will allow you to remove a tree that you were not happy with as long as it is replaced with a new Sapling. It’s always a good idea to remember the trees bring with them a quality of life for people living around them that cannot be equated in dollars. We have already mentioned they clean the air and reduce your cooling costs in the summer, but there is also a lot to be said about the calming effects of having nature right on your doorstep.